What is motion, movement how is it and what does it do? well motion is supposed to in a closed system never get more or less energy than that which is already present in a closed system. In the physical or material sense this is correct. But there is another kind of motion that is created, brought into being and that is Spiritual motion. The Spiritual motion is created from the will of the spirit. It has the ability to apply motion where there was none, to remove motion where there is some or to even change the motion of something all together. In the physical reality motion can only be passed along my something in motion and that something when imparting motion losses some of its motion. But the spirit a creature of pure energy may impart motion to objects at no loss of self. Because in imparting motion it creates it, not passing along the motion but creating it. This is where man got lost. His intelligence of the material took over his wisdom of creation. Though this is a finite creation in having only so much a singular infinity it is also infinite in that it has within it the ability to change. Energy is always being added subtracted or changed and is in constant motion. So if in the physical I push an object it moves as long as I have more power being applied to the object than the object has to resist. But in the spiritual I may just project energy till it is sufficient to create the motion I desire. In this I bring energy into being with my will, thoughts, spirit or what have you by tapping into the power of the spirit which is energy and the creation of energy. So when Christ said nothing leaves my mouth that does not return fulfilled he showed this. He also showed how dangerous it is to just say things random and without thought of the consequences. In physics, motion is a change in position of an object with respect to time also on its reference point. Motion is typically described in terms of displacement, distance (scalar), velocity, acceleration, time and speed. Motion is observed by attaching a frame of reference to a body and measuring its change in position relative to that frame. In physics, motion in the universe is described through two sets of apparently contradictory laws of mechanics. Motions of all large scale and familiar objects in the universe (such as projectiles, planets, cells, and humans) are described by classical mechanics. Whereas the motion of very small atomic and sub-atomic objects is described by quantum mechanics. Classical mechanics is used for describing the motion of macroscopic objects, from projectiles to parts of machinery, as well as astronomical objects, such as spacecraft, planets, stars, and galaxies. It produces very accurate results within these domains, and is one of the oldest and largest subjects in science, engineering, and technology. Whenever one body exerts a force F onto a second body,(in some cases, which is standing still) the second body exerts the force −F on the first body. F and −F are equal in magnitude and opposite in sense. So, the body which exerts F will go backwards. Newton's three laws of motion, along with his Newton's law of motion, which were the first to accurately provide a mathematical model for understanding orbiting bodies in outer space. This explanation unified the motion of celestial bodies and motion of objects on earth. Classical mechanics was later further enhanced by Albert Einstein's special relativity and general relativity. Motion of objects with a high velocity, approaching the speed of light; general relativity is employed to handle gravitational motion at a deeper level. Quantum mechanics is a set of principles describing physical reality at the atomic level of matter (molecules and atoms) and the subatomic (electrons, protons, and even smaller particles). These descriptions include the simultaneous wave-like and particle-like behavior of both matter and radiation energy, this is described in the wave–particle duality. In classical mechanics, accurate measurements and predictions of the state of objects can be calculated, such as location and velocity. In the quantum mechanics, due to the Heisenberg uncertainty principle), the complete state of a subatomic particle, such as its location and velocity, cannot be simultaneously determined. In addition to describing the motion of atomic level phenomena, quantum mechanics is useful in understanding some large scale phenomenon such as superfluidity, superconductivity, and biological systems, including the function of smell receptors and the structures of proteins. Humans, like all known things in the universe, are in constant motion,:8–9 however, aside from obvious movements of the various external body parts and locomotion, humans are in motion in a variety of ways which are more difficult to perceive. Many of these "imperceptible motions" are only perceivable with the help of special tools and careful observation. 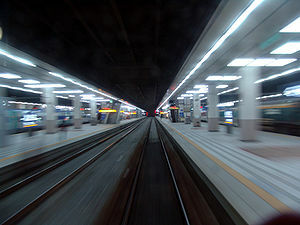 The larger scales of "imperceptible motions" are difficult for humans to perceive for two reasons: 1) Newton's laws of motion (particularly Inertia) which prevent humans from feeling motions of a mass to which they are connected, and 2) the lack of an obvious frame of reference which would allow individuals to easily see that they are moving. The smaller scales of these motions are too small for humans to sense. Spacetime (the fabric of the universe) is actually expanding. Essentially, everything in the universe is stretching like a rubber band. This motion is the most obscure as it is not physical motion as such, but rather a change in the very nature of the universe. The primary source of verification of this expansion was provided by Edwin Hubble who demonstrated that all galaxies and distant astronomical objects were moving away from us ("Hubble's law") as predicted by a universal expansion. The Milky Way Galaxy, is moving through space. Many astronomers believe the Milky Way is moving at approximately 600 km/s relative to the observed locations of other nearby galaxies. Another reference frame is provided by the Cosmic microwave background. This frame of reference indicates that The Milky Way is moving at around 552 km/s. The Milky Way is rotating around its dense galactic center, thus the sun is moving in a circle within the galaxy's gravity. Away from the central bulge or outer rim, the typical stellar velocity is between 210 and 240 km/s (about half-million mi/h). All planets and their moons move with the sun. Thus the solar system is moving. The Earth is rotating or spinning around its axis, this is evidenced by day and night, at the equator the earth has an eastward velocity of 0.4651 km/s (1040 mi/h). The Earth is orbiting around the Sun in an orbital revolution. A complete orbit around the sun takes one year or about 365 days; it averages a speed of about 30 km/s (67,000 mi/h). The Theory of Plate tectonics tells us that the continents are drifting on convection currents within the mantle causing them to move across the surface of the planet at the slow speed of approximately 1 inch (2.54 cm) per year. However, the velocities of plates range widely. The fastest-moving plates are the oceanic plates, with the Cocos Plate advancing at a rate of 75 mm/yr (3.0 in/yr) and the Pacific Plate moving 52–69 mm/yr (2.1–2.7 in/yr). At the other extreme, the slowest-moving plate is the Eurasian Plate, progressing at a typical rate of about 21 mm/yr (0.8 in/yr). The human heart is constantly contracting to move blood throughout the body. Through larger veins and arteries in the body blood has been found to travel at approximately 0.33 m/s. Though considerable variation exists, and peak flows in the venae cavae have been found between 0.1 m/s and 0.45 m/s. The smooth muscles of hollow internal organs are moving. The most familiar would be peristalsis which is where digested food is forced throughout the digestive tract. Though different foods travel through the body at rates, an average speed through the human small intestine is 2.16 m/h (0.036 m/s). Typically some sound is audible at any given moment, when the vibration of these sound waves reaches the ear drum it moves in response and allows the sense of hearing. The human lymphatic system is constantly moving excess fluids, lipids, and immune system related products around the body. The lymph fluid has been found to move through a lymph capillary of the skin at approximately 0.0000097 m/s. The cells of the human body have many structures which move throughout them. Cytoplasmic streaming is a way which cells move molecular substances throughout the cytoplasm. Various motor proteins work as molecular motors within a cell and move along the surface of various cellular substrates such as microtubuless. Motor proteins are typically powered by the hydrolysis of adenosine triphosphate (ATP), and convert chemical energy into mechanical work. Vesicles propelled by motor proteins have been found to have a velocity of approximately 0.00000152 m/s. According to the laws of thermodynamics all particles of matter are in constant random motion as long as the temperature is above absolute zero. Thus the molecules and atoms which make up the human body are vibrating, colliding, and moving. This motion can be detected as temperature; higher temperatures, which represent greater kinetic energy in the particles, feel warm to humans whom sense the thermal energy transferring from the object being touched to their nerves. Similarly, when lower temperature objects are touched, the senses perceive the transfer of heat away from the body as feeling cold. Within each atom, electrons exist in an area around the nucleus. This area is called the electron cloud. According to Bohr's model of the atom, electrons have a high velocity, and the larger the nucleus they are orbiting the faster they would need to move. If electrons 'move' about the electron cloud in strict paths the same way planets orbit the sun, then electrons would be required to do so at speeds which far exceed the speed of light. However, there is no reason that one must confine one's self to this strict conceptualization, that electrons move in paths the same way macroscopic objects do. Rather one can conceptualize electrons to be 'particles' that capriciously exist within the bounds of the electron cloud. Inside the atomic nucleus the protons and neutrons are also probably moving around due the electrical repulsion of the protons and the presence of angular momentum of both particles. Light propagates at 299,792,458 m/s, often approximated as 300,000 kilometres per second or 186,000 miles per second. The speed of light (or c) is the speed of all massless particles and associated fields in a vacuum, and it is the upper limit on the speed at which energy, matter, and information can travel. Rectilinear motion (Linear motion) – motion which follows a straight linear path, and whose displacement is exactly the same as its trajectory.